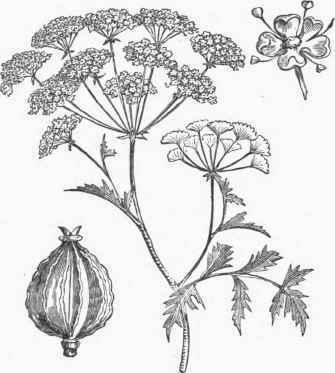 Conium, a genus of umbelliferous plants, of which 0. maculatum, the poisonous hemlock, is the best known species. This is an erect, branching, biennial plant, from 2 to 5 ft. high, with a tap-shaped root, smooth hollow stem, fern-like leaves, greenish white flowers, and globular crenellated fruit. The leaves when bruised emit a peculiar and disagreeable odor. It is a native of Europe, and now grows wild in the United States. It was used in medicine in the time of Dioscorides, and in all probability was the poison with which Socrates was put to death. Its activity depends upon a volatile alkaloid, conia, which is a poison of extreme energy. This alkaloid is contained in the leaves and seeds. The most efficient preparations of the drug are a fluid extract from the immature seeds and the succus. The latter is expressed from the green leaves and preserved by the addition of alcohol. The extract and tincture from the dried leaves are inert or nearly so. In medicinal doses the root is quite inert, and is not poisonous even when taken in quantities like a vegetable at an ordinary meal. The symptoms observed after a full dose (3 to 5 1/2 drachms of the British succus for a healthy adult) are giddiness, indistinctness of vision, and a feeling of weakness and languor. When poisoning takes place, the weakness becomes actual paralysis, which may cause death, with or without convulsions, by involving the respiratory muscles, the intelligence and sensibility being unaffected. The symptoms resemble those produced by woorara, the South American arrow poison, and are probably due to a similar condition, a paralysis of the motor nerves, especially of their terminations, the nervous centres being unaffected. Conium may be used in diseases characterized by excessive or irregular motor activity, such as convulsions from teething, chorea, shaking paralysis, whooping cough, and general nervous irritability. It seems also in some cases to have a decided effect in relieving pain. It was at one time supposed to retard the progress of cancer, but more exact observation has shown this notion to be unfounded. The alkaloid, conia, is rarely used in medicine. The dose of the fluid extract is 8 or 10 drops three times a day, increased to half a teaspoonful or more, if necessary. The succus of the British Pharmacopoeia may be given in similar doses.